Will Samsung's Galaxy X foldable phone debut in September? Samsung seems poised to unveil a foldable phone this year as more reports stack up that a bendy handset is coming, and soon. The latest filing to bolster this prognostication comes from The Korean Herald, citing sources familiar with the matter. The sources say Samsung is "highly likely" to lift the veil on a foldable smartphone in Q3 2017. More than 100,000 units are expected to roll out in the quarter, one source said. We've heard about a 2017 foldable Samsung phone before, and it's been dubbed the Galaxy X. Previous rumors have also pointed to a launch late in the year, including a Twitter leak last week that pegged Q3 or Q4 2017 as its release timeframe. The big IFA 2017 tech show takes place in September - the end of Q3 - so the timing would line up for Samsung to lay bear its latest creation in Berlin, based on today's report. Another wrinkle to the Herald's report is that the Samsung phone will fold outward as opposed to in on itself. When unfolded, the handset will transform into a working 7-inch tablet. Samsung apparently started out developing a device that folded inward, but switched gears in August 2016, thinking it'd be too much of a hassle for someone to unfurl the phone anytime they wanted to use it. We've seen this fold-out design before in devices created by Lenovo, including a phone that turns into a wearable device and a foldable tablet that becomes a phablet-sized device. Though Samsung is seemingly pushing ahead with its foldable smartphone, sources say it could nix a 2017 unveiling due to marketing and profitability concerns. A decision reportedly won't be made until an executive reshuffle is completed in February or March. One factor that could spur an unveiling is LG's reported plans to produce 100,000 foldable devices in Q4. One source said LG has more advanced outward folding tech than Samsung, though the LG G5-maker may let other companies tap its technology rather than use it for its own products. 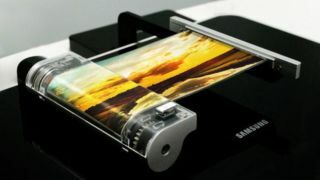 Even if a Samsung unveiling doesn't come to pass, we seem to be on the cusp of foldable devices coming to our pockets. Whether they prove anything more than a neat party trick remains to be seen, but it's a gamble some of the world's top tech firms appear willing to take.